As best basic part we woud like to present tfoX, the inducer of natural competence in Vibrio species. Since scientific progress keeps accelerating in the past years, the fast production of results gains more and more importance. 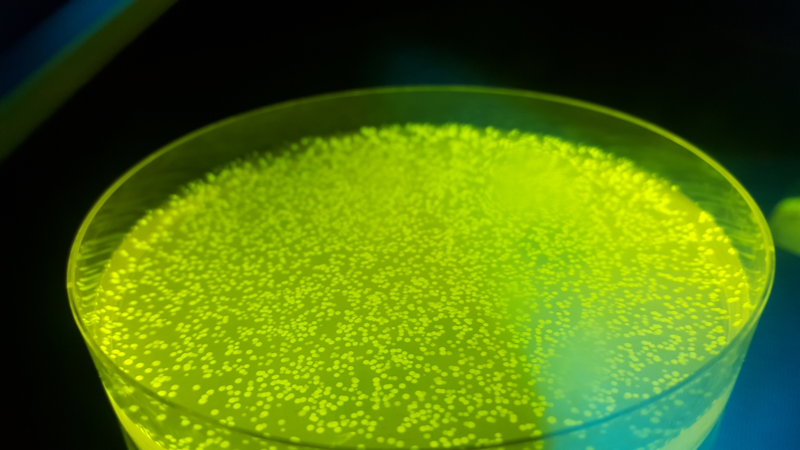 We are convinced that in the near future the community of synthetic biology will replace E. coli by the much faster growing organism V. natriegens. We strongly believe that our best basic part tfoX will support you in speeding up your research. Making this part accessible for everyone we would like to accelerate engineering biology and help you to make the world a better place. Tfox is known as the inducer of natural competence in some Vibrio species like V. natriegens. This ability of cells to take up free DNA is called competence. A special kind is the natural competence. In 1928, natural competence was first observed by Frederick Griffith even if he did not understand the genetics behind (Griffithet al.1928) . Thanks to many more great scientists who did research in this area, we now know a lot about natural competence and the ability of some bacteria to take up free DNA. In their natural environment, the regulator protein Tfox activates Type VI secretion systems (T6SSs) and allows bacteria to penetrate prey cells, leading to cell lysis and the release of DNA. The naturally competent cells can take up the free DNA from their environment and utilize it for genomic modifications by homologous recombination into their genome. Although much progresses has been made in this area, the molecular details of natural competence are not understood completely (Wuet al.2015) . For V. cholerae, it is known, that the expression of tfoX is induced by surface contact to chitin (Figure 1). Even though the V. natriegens genome is encoding a tfoX gene, its natural inducer is not known until now. However it is known, that the induction of expression of the V. cholerae tfoX is leading to competence in V. natriegens cells as well. (Hayes et al. 2017). Figure 1: Schematic figure on mode of action of TfoX in V. cholerae. 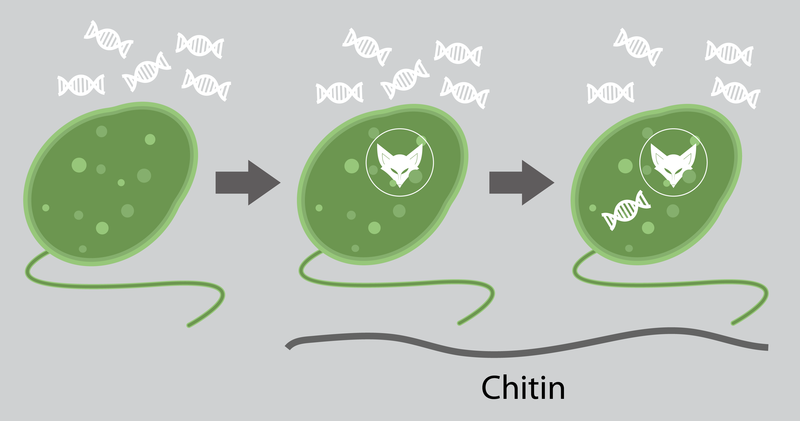 When cells get in contact with chitin, tfoX is expressed. Since TfoX is a positive regulator of natural competence, DNA from the environment is taken up into the cell. We compared the domains of TfoX with the domains of homologous proteins. These domains are listed below and in Figure 2. TfoX, C-terminal (TfoX_C): C-terminal domain of TfoX found in Haemophilus influenza. This family corresponds to the C-terminal presumed domain of TfoX. The domain is found in association with the N-terminal domain in some, but not all members of this group, suggesting this is an autonomous and functionally unrelated domain. Coiled Coil region (CC): Coiled Coil domain. This family is found in many proteins. Sometimes they are responsible for self-interaction, sometimes they are used to keep distance to other proteins. Since we are convinced, that E. coli will be replaced by V. natriegens in the next few years, we believe that the usage of natural transformation will become more significant. There are several advantages of this method in comparison to electroporation or heat shock mediated transformation. First, it is less stressful to the cells and second, you do not need to aliquot a thousands of chemically competent E. colis in Eppendorf cups every few weeks. If you are planning to do a transformation, the only thing to do is to inoculate the desired V. natriegens strain in a liquid culture, inducing the expression of tfoX (Figure 3). Additionally, modified V. natriegens strains can be produced much faster, due to the possibility to transform linear fragments for genomic modifications instead of wasting time with cloning plasmids. Even more linear fragments can be used for co-transformation, creating several genomic modifications at the same time (Hayes et al. 2017) . In the future natural transformation could be utilized in combination with genome engineering methods like MAGE and CAGE, which rely on electroporation for E.coli, that could allow more rapid genome designs, such as complete codon reassignments. Figure 3:Workflow of a natural transformation. Providing this basic part, we want to encourage the community of iGEM as well as all other scientists in the field of synthetic biology to start working with V. natriegens. Including tfoX into the modular cloning system of iGEM and the Marburg Collection we hope to usher in a new era of synthetic biology. We would love to see future iGEM teams using this basic part for further constructing their individual transcription unit variants in order to screen for the maximum efficiency for customized applications. Using tfox in full transcriptional units, we were able to perform natural transformation with plasmids (Figure 4) as well as with linear DNA to create our strains with genomic modifications. Figure 4: Plates showing the successful transformation of plasmids using natural transformation. Left plate is showingtransformation of cells with pYTK. Right plate is showing negative control. As best composite part we extended our best basic part TfoX, the inducer of natural competence in Vibrio species. We could successfully combine it with one of the inducible promoters from our Marburg Collection. Figure 1:Alignment of sequencing results of our first constructed Lvl1 tfoX plasmids showing missing basepairs at places at which black fragments are missing. As an extension of our basic part tfoX we created a full transcriptional unit enabling you to perform natural transformation in V. natriegens. First we started assembling a full transcriptional unit using a constitutive promoter. Therefore, we assembled tfoX together with the constitutive promoters J23100 or J23110 into a transcriptional unit by golden gate assembly. After transformation of this reactions into E. coli we were able to get colonies that seemed to be positive for the Lvl1 plasmids encoding tfoX because they showed the right size of fragment after plasmid preparation and test digestion, whenever we sent them for sequencing, some basepairs of the tfox gene were always missing (Figure 1). We suggest that these problems could be caused because Tfox could somehow ne toxic to E. coli cells. At this point of our project we realized how important it is to have well characterized, tight, inducible promoters for the usage in V. natriegens. In addition to constitutive promoters, the Marburg Collection contains the inducible promoters, pTet and pTrc. 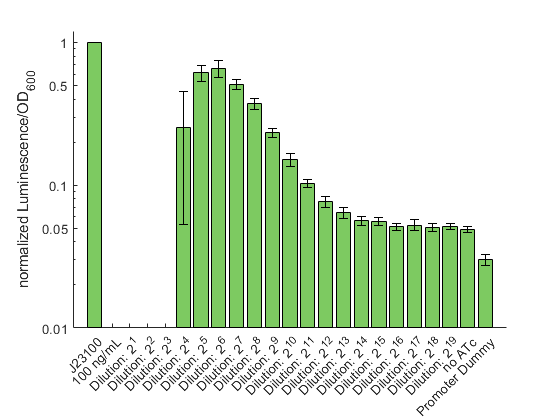 From our measurements of the promoter characterization, we learned that the pTet promoter is the tightest one showing the lowest value of Luminescence without induction (Figure 2). The pTet promoter can be induced by the tetracycline derivative anhydrotetracycline (ATc). ATc is much less cytotoxic than IPTG but still capable of binding and altering the structure of the repressor TetR, leading to release of the promoter and enabling transcription. Figure 3:1 %- Agarose gel of the test digest. 2-logDNA ladder is used as marker on agarose gels. Using this suitable promoter for V. natriegens we successfully assembled a plasmid containing a full transcriptional unit with a pTet promoter and did not had any problems during the cloning process. By Test Digestion and sequencing we could prove, that now the sequence of Tfox was correct (Figure 3 and 4). Figure 4:Alignment of sequencing results of our final constructed Lvl1 tfoX plasmid showing the correct sequence. As we have already shown in the chapter of our basic part, we were able to perform natural transformation using this plasmid and could demonstrate, that GFP which is encoded on pYTK is expressed by V. natriegens. Figure 5:Plate showing a successful transformation of pYTK using natural transformation. Figure 6:Plate showing a successful transformation of pYTK using natural transformation with functioning pYTK. We created a novel golden-gate based cloning toolbox consisting of 123 parts. Plasmid maps of all parts can be downloaded here.